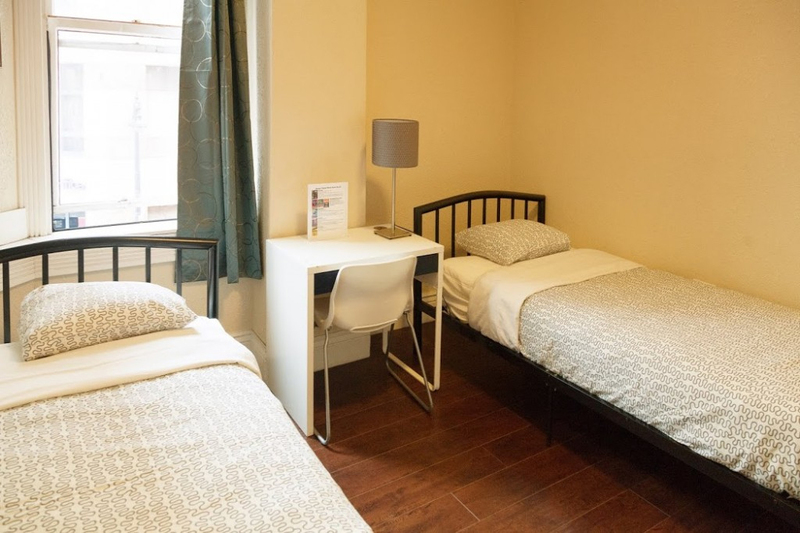 The Orange Village provides Single rooms, Double rooms and Dorm Room (with maximum of 4 beds per unit), and full private bathroom in most of rooms, including dorms. All bedrooms have new hardwood floor, clean, comfortable and newly renovated. Dorm Rooms also have backpack-sized lockers for each guest. Reserve a whole dorm for your group, or you could book a bed in a shared dorm and share a room with other travellers from all around the world. Modern shared bathrooms are right outside the room in the hallway. All dorms are same gender only. All dorms have a hand sink inside the room and a locker for every guest, perfect for backpack storage. All our ensuite dorms have an ensuite bath tub or shower booth. A hand sink is inside all our dorms, along with a locker for every guest. Three bed dorms have one bunk bed and one twin sized bed. All our three bed dorms contain a hand sink. A closet, satellite TV, mini-fridge, and microwave are also included. However, please note that this room has neither lockers nor private bathroom. One or two beds can be booked in a three bed dorm, or the whole room. Up to three guests can stay in a three bed dorm. Our private rooms have one double, one queen or two twin beds, hand sink, refrigerator, microwave, satellite TV, linens and towels. All private rooms are also offered complementary conditioning shampoo and luggage rack. Double bed private ensuite is with one full sized bed along with an ensuite bathroom with a shower booth and a hand sink in the room. Please note that all double bed private rooms are private. Double bed private ensuite is with one full sized bed along with a hand sink in the room. Modern shared bathrooms are along the hallways very near to your room. Please note that all double bed private rooms are private. Twin bed private ensuite room has two twin sized beds along with an ensuite bathroom with a shower booth and a hand sink in the room. Please note that all our twin bed private ensuite rooms are private. Deluxe private ensuite rooms is a queen sized bed, a hand sink, refrigerator, microwave, satellite TV, shower booth, closet, linens and towels inside the room. Please note that all deluxe private rooms are private.